Using Microplane® Adjustable Fine Grater, grate Parmesan; set aside. Cut off ends of zucchini. 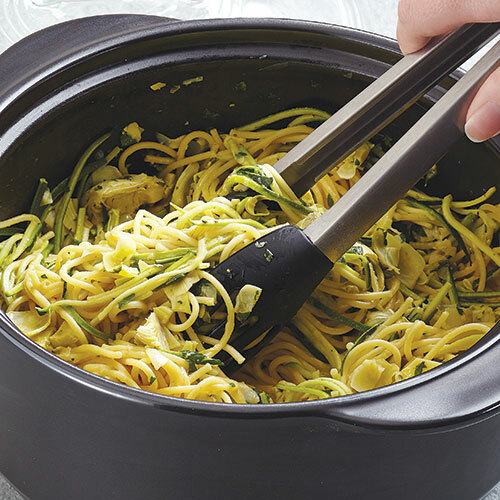 Using Julienne Peeler, cut zucchini into long strips (avoiding seeds) to measure 2 cups (500 mL). Cut strips in half with Utility Knife. Add artichoke mixture, Parmesan and zucchini to Dutch Oven. Toss to coat with Chef’s Tongs. Let stand, covered, 5 minutes. Season to taste with salt, if desired. To make this recipe vegetarian, you may substitute unsalted vegetable stock or low-sodium vegetable broth for the unsalted chicken stock. You can substitute ¼ cup (50 mL) Garlic-Infused Canola Oil* for the olive oil and omit the garlic. You can add 12 oz (350 g) cooked boneless, skinless chicken breasts or 12 oz (350 g) peeled and deveined, large cooked shrimp to the pasta.